One of my goals in January was to work out at least three times per week. I’m pretty sure that “working out” has been one of my New Year’s resolutions for about ten or fifteen years. Have I ever stuck with it? Did I stick with it this year? I’m checking-in today with a six-month (okay, technically seven month) update on my workout goals for this year. 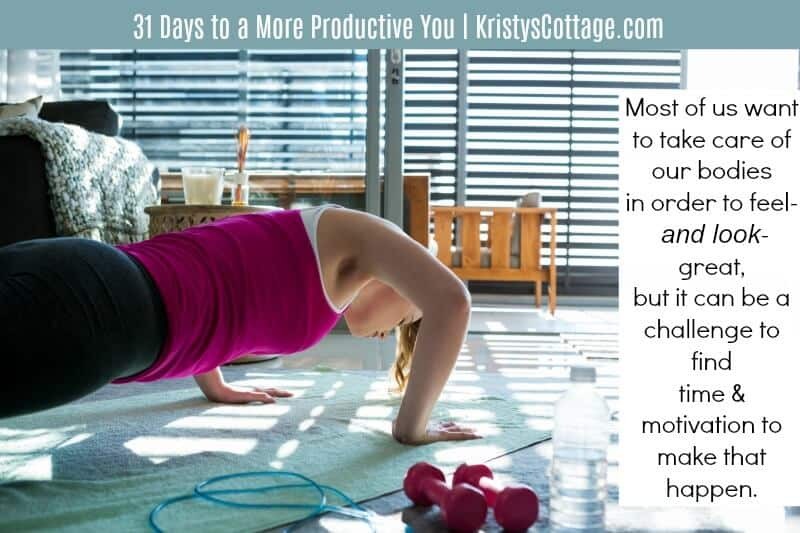 If you missed it, you can check out my post, The Productive Woman’s Habit: Exercise, right here. This post tells why and how I got started working out as a busy mom. I’m happy to say that I’ve cultivated a pretty consistent habit of working out. Most weeks, I work out five days per week. On the crazy, crazy weeks, I still manage to squeeze in two to three workouts. Let me share a few specifics with you. 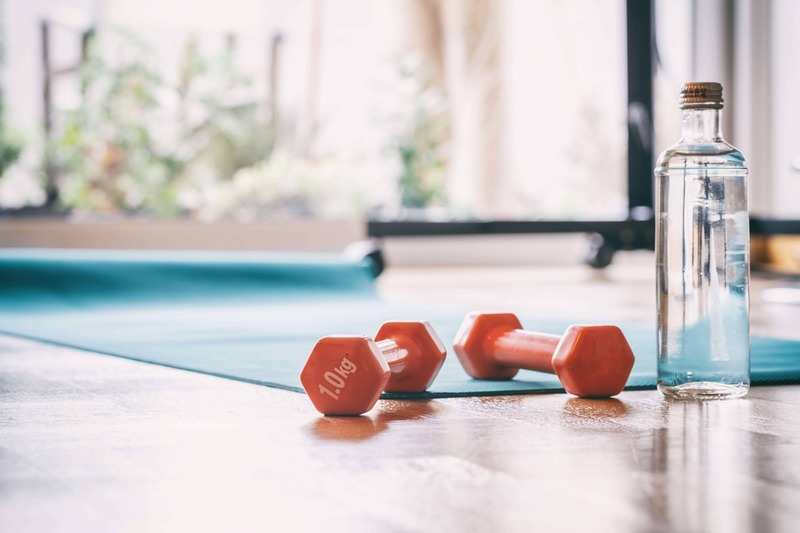 If you’re trying to get started with a consistent workout routine, I hope this post will help motivate you to do that! If you’re not an athletic type woman, don’t worry. Neither am I! This post is very much about reaching goals in real life, and striving for progress not perfection. What workouts am I doing? In January, I started out with Moms Into Fitness with Lindsay Brin. I knew I had issues with diastasis recti, so I opted for the 12-week postpartum workout. But sadly, I had never really recovered my core health after any of my five pregnancies. I’ll be really, really honest: the postpartum workout was tough! By the time I had pushed through the first two months, I was starting to notice some changes. The workouts felt easier, I could do more without having to stop for breaks, and I felt better. Best of all, I wanted to work out! I completed the 12-week postpartum workout in April. By that time, my diastasis recti had improved from “better,” to completely healed. With my core in better shape, I felt super motivated to keep going! In June, I jumped in with Lindsay’s Summer Shape Up. We’re all super busy, so no one really “has time” to work out, right? We have to make time, which means taking care of our bodies has to become a priority. My goal is to work out at least three days every week. To really push a little harder, I work out five days per week whenever possible. When I have about thirty minutes in the morning or afternoon to devote to exercising, I stick with my Moms Into Fitness calendar. On the extra busy days when I need a quick but intense work out, I squeeze in XHit’s arm toning and 7-minute ab workout. I don’t stress about the days when I can’t exercise for a full twenty or thirty minutes. I do what I can, and just keep doing something that yields results. This is a practical balance for me in this busy season of life. What health results am I seeing? I have lots of energy! I rest better than ever at night. My body just feels stronger. One of my biggest achievements so far has been healing my diastasis recti. After five pregnancies, I’m happy to put an end to the “mom pooch” and really begin to heal my core. What body results am I seeing? My two biggest “problem areas” have always been my upper arms and my waist line. I gain weight in my upper body; since I have a narrow build (no hips!) it’s easy for me to get “thick” through the torso area. After working out consistently for six-plus months, I am happy to see some encouraging results. Just last week, I tried on a dress that I had worn earlier this year (about two months ago). The dress was super tight on me in the upper body, and I figured I would have to get rid of it. When I tried it on recently, it fitly loosely in the upper body- I could visibly see and feel the difference! My arms are slowly toning up, but it’s not happening over night. I’m still working on strengthening my triceps, but the good news is that a lot of my tops, blouses and blazers are fitting better in the arms. Tight-fitting sleeves have always been an issue for me, so I’m happy to see some results. I’m far from a work-out junkie, and I’m not trying to look like a model… so don’t get any idealistic visions of what I’m doing or what I look like. I’m a wife and mom who tries to take care of herself, but there’s no perfection happening! What I can tell you is that consistency pays off, and it’s totally worth the effort to take care of the body God gave you. If you’re not the athletic type, I totally relate. I’m not either, but I find that I actually enjoy working out these days. I keep it simple but challenging, and make exercising a priority that fits into my very busy life. This week, I started a brand new workout routine: 30-Day Core, with Lindsay Brin. I’m excited to see more progress in the next few weeks! —> I’ll check in again with another update in a few months… and that gives you plenty of time to start a workout routine, if you don’t already have one. Moms Into Fitness– these workouts are specifically designed for moms. They include a printable calendar/workout schedule and recommended menu plans (personally, I don’t use the menus, but they are there if you need them). Moms Into Fitness on You Tube– free workout videos to get you started! XHitDaily– tons of free workout videos! I like these because they’re super effective, but quick! 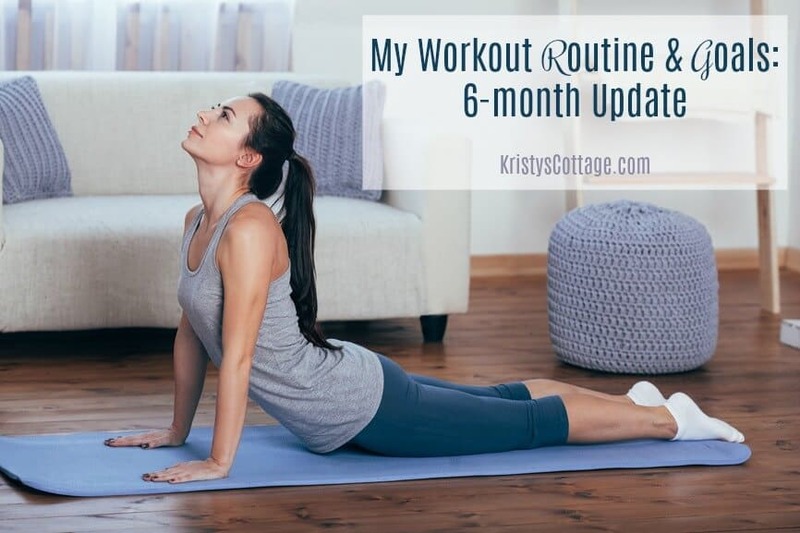 Kristy’s “Fitness” Pinterest Board– my personal compilation of helpful workouts, articles, etc. Don’t feel like you have to do the workouts that I do! Maybe you prefer cardio over toning workouts. Or maybe you’d rather jog or swim or go to a Pilates class. Find what works for you, and do it consistently! Most of all, believe that you CAN do it! Do you need to start working out? What would you add to this list of resources? 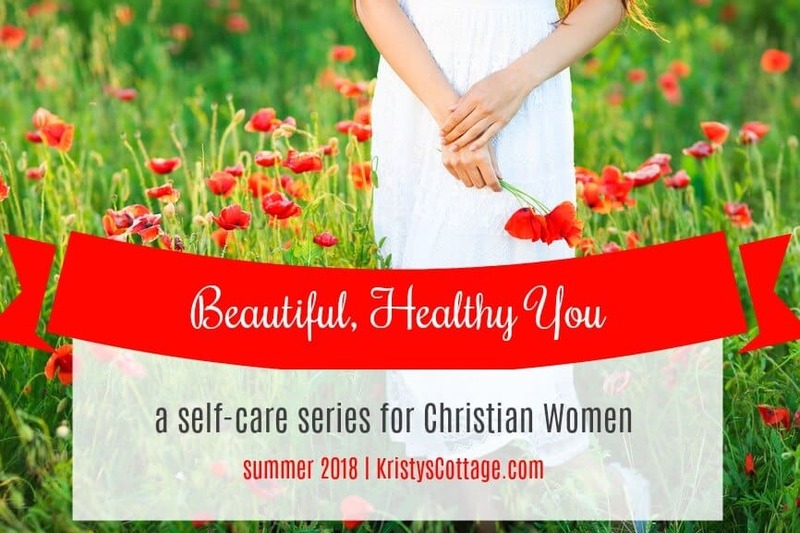 This post is part of my Beautiful, Healthy You summer-long series. and subscribe to receive new posts via email! « How to Build a Modest Summer Wardrobe That You’ll Love!